Marquis® reinvented the traditional round hot tub with the Celebrity Hot Tubs Monaco Elite Adapting the classic round shape, with modern features, accommodating up to five people, it’s perfect for a solo soak or quiet escape. 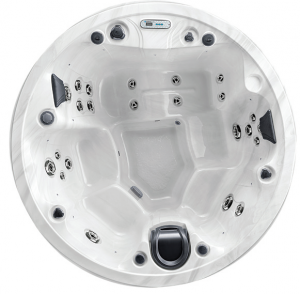 Optimal for small spaces, the Elite hot tub features a lounge (unique for round hot tubs), two deep therapy seats, two bucket seats, and Marquis’ highflow therapy with jets from neck to feet. Upgrade the Monaco Elite with optional ConstantClean+, stainless steel jets, Motown™ audio with Bluetooth, Twilight™ LED multipoint accent lighting, and 240V performance upgrade.. The Monaco is also available in a standard configuration.